Baker, G.R., A. MacIntosh-Murray, C. Porcellato, L. Dionne, K. Stelmacovich and K. Born. 2008. "Learning from High-Performing Systems: Quality by Design." High Performing Healthcare Systems: Delivering Quality by Design. 11-26. Toronto: Longwoods Publishing. Improvements in science, technology and care have offered the promise of better healthcare and improved health. But many healthcare systems have been unable to cope with the acceleration of knowledge growth, thus creating a gap between the care that is possible and the care that is delivered. Many commentators bemoan the inconsistent quality and increasing costs of current healthcare and fear the future burdens posed by aging populations and the costs of adopting emerging therapeutic and diagnostic innovations. Providing consistent, high-quality care is a challenge even in the countries that spend the most on healthcare (Institute of Medicine 2001). The increasing complexity of healthcare systems in industrialized countries has further exacerbated the quality chasm, thereby leading to a healthcare delivery system that is complicated, inefficient and uncoordinated. Improving the safety and quality of care is an increasingly important objective in all health systems. Advances in measurement have helped to highlight variations between organizations, and across regional and national health systems. For example, the Commonwealth Fund, a health foundation based in the United States (US), has sponsored multi-country surveys of patients and physicians for 10 years, releasing the results of these surveys annually.1 The results demonstrate that the US system, which is the most expensive of the seven systems studied, performs poorly in most dimensions compared with other countries (see Table 1). The Canadian system is the most expensive of the non-US systems; however, its performance is the lowest on several dimensions of quality, including the provision of appropriate, coordinated and patient-centred care, and next-to-lowest in most other dimensions (Commonwealth Fund 2007). The Organisation for Economic Co-operation and Development (OECD) recently released a report based on administrative data. It revealed wide variations in performance between Canada and the other OECD countries. For example, in 2005 the 30-day mortality rate from acute myocardial infarction was lower in Canada than the average for OECD countries, while the 30-day stroke case fatality rate was higher (Organisation for Economic Co-operation and Development 2007). Source: Calculated by the Commonwealth Fund based on the Commonwealth Fund 2004 International Health Policy Survey, the Commonwealth Fund 2005, International Health Policy Survey of Sicker Adults, the 2006 Commonwealth Fund International Health Policy Survey of Primary Care Physicians, and the Commonwealth Fund Commission on a High Performance Health System National Scorecard. Commonwealth Fund (2007). As these results suggest, no country has succeeded in demonstrating a consistently high level of performance. Moreover, the national variations incorporate a range of performance within each country for different geographic regions and/or health systems. On individual measures, for instance, some regions in countries that rank low may perform better than regions in countries that rank high. Country rankings provide useful indicators of the effectiveness of national policies and structures; however, they are clearly insufficient as guides to the elements of success. Moreover, examining the variations on their own does not explain why some regional systems or hospitals are able to achieve better outcomes than their peers. Indeed, despite agreement on the goal of improving quality in all healthcare systems, there remains considerable disagreement on effective and affordable means to improve performance. Few studies have attempted to examine whether any regional or local systems are capable of achieving consistently better outcomes across different disease programs, levels of care and local delivery organizations. Identifying such high-performing health systems and understanding the strategies and investments they have made is more than an academic issue. The practices these healthcare systems employ can inform strategy development and guide the allocation of resources in systems seeking to improve their performance. Identifying improvements to current care delivery structures and translating approaches from high-performing systems to local delivery organizations will help to spread more reliable and cost-effect-ive care. While there are many examples of local successes, too often these are "islands of excellence in a sea of mediocrity" (Rogers and Bevan 2002) rather than reflections of consistent approaches to good practice. High-performing healthcare systems are those that have created effective frameworks and systems for improving care that are applicable in different settings and sustainable over time - but is this an achievable goal in systems that are not high-performing? The search for sustainable and affordable quality is not a problem unique to healthcare. Indeed, in many industries there has been a search for strategies and investments that yield consistently better results. Among notable success stories are the achievements of Toyota Motor Corporation based on the development of the Toyota Production System, an approach to manufacturing that has revolutionized the auto industry (Womack et al. 1990). The critical first step for achieving such high performance levels is to recognize that quality must be defined as a system property and not as a characteristic of individuals who work in a system. Healthcare has traditionally defined excellence in terms of individual physicians or other caregivers. In this view high quality results from the practice of highly trained expert clinicians. Yet patient safety experts such as James Reason (1995) and Lucian Leape (1994) have long argued that safety cannot be improved by urging individual clinicians to be more careful. Instead, we must design systems that reduce the likelihood of errors, make errors more visible and provide the means to remediate before harm occurs. What aspects of healthcare systems are key to facilitating high performance? What do we know about the relationships among these elements and among various important outcomes? What is the best way to study these issues? What is a system capable of improvement? Why an organization produces its services - Who are the customers and what are the broader social needs the organization fulfills? How those services are produced - What are the processes of daily work or, in other words, the means of production? How the organization improves its services - What are the improvement activities or means of improvement? Efforts to improve healthcare services are often termed "quality improvement." Quality improvement is an umbrella term that includes many overlapping concepts, such as continuous improvement, organization-wide commitment and worker participation, knowledge of customer needs, systems thinking, systematic analysis of processes, use of scientific data-driven analytic methods and involvement of interdisciplinary and cross-functional teams (Blumenthal and Kilo 1998; Lucas et al. 2005; McLaughlin and Kaluzny 1994; O'Brien et al. 1995; Øvretveit and Gustafson 2002). The knowledge and skills necessary for this improvement work draw from a variety of disciplines. Different improvement methods emphasize different tools, but most quality improvement approaches include methods to analyze and improve (or design) work processes, techniques to collect and integrate information about the needs of patients and other key customers to inform the design of work, and methods for testing and implementing improvements. Similarly, Walshe and Freeman (2002: 85) note that a receptive organizational context is "a crucial determinant" of the effectiveness of quality improvement initiatives. What are the key elements that facilitate improvement work? Øvretveit and Gustafson (2002) identify eight important factors that motivate and sustain quality improvement programs. Like Ferlie and Shortell, they include leadership commitment and a supportive culture. They also add a number of structural factors (physician involvement, sufficient resources, careful program management and training) and a strategic focus on customer needs. Other analyses of critical factors supporting improvement have been made based on various data sources (see Barron et al. 2005; Franco et al. 2002; O'Brien et al. 1995). While the names for these critical factors and supportive processes vary, the main elements they contain are largely consistent. Table 2 provides an overview of the nine key attributes and component elements derived from a synthesis of these and other studies. Organization/leaders support and expect learning and innovation. Organization/leaders value staff and empower all members to participate. Organization/leaders value collaboration and teamwork. Strong administrative leadership that provides role models for organizational values. Leadership celebrates and even participates in improvement initiatives. Emphasis on developing, fostering and inclusion in decision-making for clinical leadership and champions. Board support: Board sets expectations by asking for reports on improvement initiatives and results. Board provides continuity of expectations if administrative leadership changes. Leaders set clear priorities for improvement. Improvement plans are integrated in the overall strategic plan as the means to achieve key strategic goals. Leaders demonstrate both constancy of purpose and flexibility. Operational policies and procedures, including human resources policies, provide incentives, rewards and recognition. Incentives, rewards and recognition are aligned to support improvement work. Roles and responsibilities for improvement are clearly articulated. Teams and teamwork are part of structure. Organization provides time for staff members to learn skills and participate in improvement work. Financial and material resources and human resources are available for improvement. Quality improvement support/expertise: A core group of improvement experts is available to help teams and individuals. Quality improvement department coordinates and supports initiatives. Needed clinical and administrative data are readily available. Information is available to support improvement. Organization has vehicles to communicate with stakeholders regarding priorities, initiatives, results and learning. Ample forms of communication, including newsletters, forums, meetings and intranet sites. Includes training in improvement methods, team and group work, project and meeting management, and epidemiology. Physicians are involved in planning improvement initiatives and participate as team members. Opportunities for physician and clinical leadership of improvement. Source: MacIntosh-Murray et al. (2006). If scholars in several countries with differing approaches have developed similar lists of key elements, then some might wonder why more healthcare systems have not achieved high levels of performance and reliability. The reasons for this are complex, but they likely stem from several factors. First, many of the elements identified as supporting high performance are difficult to achieve. For example, healthcare organizations must provide relevant and timely data on clinical processes in a format that guides improvement. This requires overcoming substantial technical and logistical challenges. Many organizations have found it difficult to develop skills for improving care and to create environments in which physicians "own" improvement. These components of high-performing healthcare systems are not widely shared, and there are many broader policy and resource barriers to developing them. Second, in many cases these elements are interdependent. High-performing healthcare organizations are systems of interacting, interrelated and interdependent clinical microsystems. There are also supportive elements and structures that are aligned with (and sometimes pushing against) broader health system policy and structures. Fulfilling only some of the characteristics of successful systems is insufficient for achieving high performance. Instead, high-performing systems need to develop many, if not all, of the characteristics noted above. Third, the path forward to achieve these attributes is rarely clear. Typically, we assess a system on a set of measures and judge it to be better or worse than others. But such an assessment is inevitably static; it does not tell us which strategies, structures and processes were critical for creating the system's high level of performance. Nor does it detail the leadership processes and strategic investments required over time. Fourth, when offered a list of attributes associated with high-performing systems, the temptation is to create a checklist to assess other systems that wish to emulate such performance. But reality is more complex than a checklist. Developing a high-performing system is a journey that cannot be judged solely by examining current performance. Instead, we must assess the environment and challenges the organization faced; understand the strategies and investments its leaders made; and assess the learning, mid-course corrections and current efforts made to maintain and spread high performance. Nor can we assume that the decisions one organization made will be appropriate for others that face different challenges and possess different resources. The goal of the Quality by Design project was to investigate a small number of high- performing healthcare systems to examine the leadership strategies, organizational processes and investments made to create and sustain improvements in care. Although most comparative health policy literature focuses on differences in national systems (e.g., Anderson and Hussey 2001; Arah et al. 2003; Saltman and Figueras 1998), the variation in performance within national systems suggests that important learning can be gained from assessing strategies used by regional systems or other subnational units that have achieved high performance. And although it is clear that successful improvement must take place at the microsystem level where patients, clinical professionals and other staff members interact, these microsystems depend greatly on the leadership, resources and strategies of leaders in their broader organizations. Nelson et al. (2007) have recently published a study of high-performing microsystems. Although they discuss the elements of the broader macrosystems that support the work of successful microsystems, their primary focus is on the tools and unit-level strategies for creating improvement at the front lines. By contrast, the emphasis in this study is understanding the strategies and investments of high-performing health systems. This fills a gap in the literature between studies of national healthcare policies, on the one hand, and the analysis of clinical microsystems and the methods and tools used to secure front-line improvements, on the other hand. This focus is not unique. Several frameworks have been developed in recent years to assess performance excellence in organizations. In the US, the Malcolm Baldrige National Quality Program was created to recognize companies that have been successful in improving the quality of their goods and services and to stimulate improvement in other US firms. The Baldrige awards were first given in 1988 and the first award to a healthcare organization was made in 2002 (National Institute of Standards and Technology 2007). The criteria on which organizations are judged are based on a framework that assesses performance in seven areas: leadership; strategic planning; customer and market focus; measurement, analysis and knowledge management; human resources; process management; and, results. As of 2007 eight healthcare organizations had won the Baldrige Award. Senior leaders from several of these organizations have written detailed accounts of their organization's efforts to improve quality (e.g., Ryan 2007; Stubblefield 2005). Similar awards in Canada (e.g., the National Quality Institute's Canada Awards for Excellence) and Europe (the European Foundation for Quality Management's Excellence Awards) have established similar criteria and processes for judging excellence (European Foundation for Quality Management 2003; National Quality Institute nd). Healthcare organizations have used these awards programs as guides to assessing and improving their performance. Mary Jean Ryan (2007) and other winners of the Baldrige Award identify the Baldrige framework and criteria as a useful guide to assessing their organizations and helping to direct the leadership of improvement. Many thousands of copies of the Baldrige criteria have been downloaded or purchased, and both Baldrige and other award criteria have been used to inform or evaluate leadership strategies (e.g., Goldstein and Schweikhart 2002; Nabitz et al. 2000). However, by themselves the long lists of criteria and questions in these assessment frameworks are daunting and require considerable effort to complete. Moreover, the frameworks are similar, but not identical (MacIntosh-Murray et al. 2006), and possible gaps in them have been identified (Counte and Meurer 2001). Lastly, many descriptions of award-winning organizations emphasize their current performance rather than the strategies that led to it. The accounts by Baldrige winners do, however, describe their journeys and are useful sources of ideas. Yet these accounts emphasize different issues and focus only on US organizations. There are, therefore, few studies that have employed consistent methods for assessing high-performing healthcare organizations in different policy environments. Two notable exceptions are the recent book by Bate et al. (2008), who examine quality improvement efforts in seven hospitals in the US and Europe, and McCarthy and Blumenthal's (2006) study of the work of six US organizations that have been leaders in patient safety strategies. There are no international performance data that rank regional healthcare systems. Therefore, in order to select the systems studied in this project we devised a nomination and selection process that relied on experts to identify health systems that have successfully invested in improvement resources and demonstrated measurable performance improvements over time. We asked 21 international experts in quality improvement and health systems monitoring to nominate health systems (defined as regional authorities, trusts and/or networks/systems of organizations, as opposed to single hospitals) they believed had made significant investments in quality improvement and had achieved demonstrable, measurable improvements as a result of those investments. These experts were chosen according to their reputations in the fields of practice and academia as being knowledgeable about systems that were successful in improvement. Among our experts were individuals from the European Society for Quality in Healthcare, Institute for Healthcare Improvement and the Joint Commission for the Accreditation of Healthcare Organizations International, as well as health system providers, researchers and decision-makers. Fourteen experts submitted 40 nominations of 22 health systems. Of the 22 systems, 13 were in the US, 5 were in Europe and 3 were located elsewhere. Seven systems were nominated more than once. We examined the accomplishments of these seven systems and selected five based on their capabilities in sustaining quality improvement efforts and results. Our team collected information on the chosen systems through a review of publications and data available on the Internet and from other sources. From May 2006 through September 2007, between two and four team members paid one visit to each of the five sites. In advance of each visit, the researchers reviewed a range of background documents provided by system informants, including, for example, strategic plans, annual reports, terms of reference, improvement reports and Baldrige Award or other detailed applications for public recognition. Site visits included meetings and interviews with system leaders, clinicians, administrators and educators as well as local and national health system leaders and policy-makers. The case studies were crafted based on thematic analysis of extensive notes recorded during the interviews, integrating details from the strategic and operational documents from each site. Key interview participants at each of the five sites reviewed the draft reports to ensure factual accuracy. A study advisory committee comprised of leaders from health organizations in Ontario and elsewhere in Canada met twice to discuss the study framework as well as case report drafts. Members of this committee provided helpful insights and guidance, and validated the relevance of the major themes in the Canadian context. In addition to the five international cases, we investigated two Canadian systems. These cases were selected with guidance from members of the study advisory committee as representative of better-performing Canadian healthcare systems that exemplified elements present in the international cases. While none of the systems originally nominated by our experts were Canadian, we included Canadian cases in response to interest from several advisory committee members about whether characteristics of high-performing systems could be identified in Canadian organizations. The two cases provide evidence that Canadian health policies, financial environments and regulatory frameworks do not prevent the emergence of high-performing systems. These two cases were approached in a somewhat different fashion than the five international ones. Two members of the team spent several months on site - one team member at each - as part of practicum experiences for their master's degrees in health administration. During this time they collected information and conducted interviews. Other members of the team collected additional interviews and information, and drafts of the cases were reviewed and revised by several team members. Drafts of the international and Canadian cases were given to leaders in the respective organizations so they could identify factual errors in our descriptions. In addition, we sought input from external experts who knew the organizations, and we reviewed other case analyses of and literature on the healthcare systems we studied. In a few instances system leaders disagreed with some of the interpretations we made of their organizational strategies. We have duly noted where these disagreements occurred. As with any study, there are limitations inherent in the Quality by Design approach. For example, the nomination method for systems to study was influenced by expert opinion, health system visibility and case visit feasibility. The choice of other experts might have led us to different systems. However, we do not claim that our study comprises an exhaustive list of high-performing health systems internationally, nor was that our intent. In each of the cases we discuss a number of areas in which the organizations have been successful, describing the strategies, methods and tools used at a senior leadership level, detailing the organizational infrastructure and approach, and examining the methods and tools used at the front lines of care. Still, none of these systems' representatives would claim their performance is exemplary in all domains, and each one noted areas they are targeting for improvement. One of the characteristics of highly successful healthcare systems is a paradoxical stance toward success. All the organizations we studied were proud of their achievements and often sought recognition of their successes to support further efforts and reward staff members. Yet all were striving to spread their successes throughout their organizations to improve more areas of care. Indeed, an impatience - rather than satisfaction - with current performance appears to be a hallmark of high-performing healthcare systems. Variations in performance also mean that in some areas these high-performing systems may be merely "average." There is no Toyota in healthcare: no one system clearly outdistances its competitors in virtually all its products and services. In selecting the systems we chose for our case studies, and in collecting and analyzing information on those cases, we sought evidence that the seven organizations had developed robust strategies and approaches. Nevertheless, some performance measures in each organization are not at the level to which system leaders might aspire. Canadian healthcare policy expert Steven Lewis has observed, "[We need to] become more adept at learning which features of international systems we can and cannot easily import, and recognize that what ails our system originates in design rather than the laws of nature" (Lewis 2007: 19). The focused case study approach allowed us to describe in more detail the developmental stories of five international and two Canadian organizations as they worked to become - and remain - high-performing systems. None of the cases is a precise road map for other systems in Canada or elsewhere. But all provide useful insights into the strategies, investments and lessons learned on the journey to excellence. By reading the stories from each system, comparing them with our own organizations and considering the policy environment and resources that provide a context for performance, we can begin to identify ideas to import. Learning from these case studies requires that we acknowledge the differences between policy contexts and timing. Moreover, in addition to recognizing the strategies and ideas that may be transferrable we need to determine the "obstacles that have to be addressed in translating practices from one system to another" (Ham 2005: 192). From country to country - and even within the same country - healthcare systems are widely divergent in terms of histories, contexts, policies, structures and other determining factors. Our study focused on high-performing systems that have very different structures, exist in policy environments that range from highly directive to facilitative and embody very different histories. Despite these differences we believe that careful study of international and local successes better enables us to evaluate the assumptions and decisions in our own environment, aspects of health system planning and operation that sometimes go unquestioned. In other words, the case studies can help us to learn about what we might try to do differently in our own systems' pursuit of quality - not by chance, but by design. Ackoff, R. 1974. Redesigning the Future. New York: John Wiley & Sons. Ackoff, R. 1994. The Democratic Corporation. New York: Oxford University Press. Adler, P.S., P. Riley, S. Kwon, J. Signer, B. Lee and R. Satrasala. 2003. "Performance Improvement Capability: Keys to Accelerating Performance Improvement in Hospitals." California Management Review 45(2): 12-33. Anderson, G. and P.S. Hussey. 2001. "Comparing Health System Performance in OECD Countries." Health Affairs 20(3): 219-232. Arah, O.A., N.S. Klazinga, D.M.J. Delnoij, A.H.A. Ten Asbroek and T. Custers. 2003. "Conceptual Frameworks for Health Systems Performance: A Quest for Effectiveness, Quality, and Improvement." International Journal of Quality in Health Care 15(5): 377-398. Barron, W.M., C. Krsek, D. Weber and J. Cerese. 2005. "Critical Success Factors for Performance Improvement Programs." Joint Commission Journal on Quality and Patient Safety 31(4): 220-226. Batalden, P.B. and J. Mohr. 1997. "Building Knowledge of Health Care as a System." Quality Management in Health Care 5(3): 1-12. Batalden, P.B. and M. Splaine. 2002. "What Will It Take to Lead the Continual Improvement and Innovation of Health Care in the Twenty-First Century?" Quality Management in Health Care 11(1): 45-54. Batalden, P.B. and P.K. Stoltz. 1993. "A Framework for the Continual Improvement of Health Care: Building and Applying Professional and Improvement Knowledge to Test Changes in Daily Work." The Joint Commission Journal on Quality Improvement 19(10): 424-447. Bate, P., P. Mendel and G. Robert. 2008. Organizing for Quality: The Improvement Journey of Leading Hospitals in Europe and the United States. Abingdon, UK: Radcliffe Publishing. Berwick, D.M. 2002. "A User's Manual for the IOM's 'Quality Chasm' Report." Health Affairs 21(3): 80-90. Berwick, D.M., B. James and M.J. Coye. 2003. "Connections between Quality Measurement and Improvement." Medical Care 41(1): I30-I38. Blumenthal, D. and C.M. Kilo. 1998. "A Report Card on Continuous Quality Improvement." The Milbank Quarterly 76(4): 625-648. Counte, M.A. and S. Meurer 2001. "Issues in the Assessment of Continuous Quality Improvement Implementation in Health Care Organizations." International Journal for Quality in Health Care 13(3): 197-207. Deming, W.E. 1986. Out of the Crisis. Cambridge, MA: MIT Center for Advanced Engineering Study. Ferlie, E. and S.M. Shortell. 2001. "Improving the Quality of Care in the United Kingdom and the United States: A Framework for Change. The Milbank Quarterly 79(2): 281-315. Goldstein, S.M. and S.B. Schweikhart. 2002. "Empirical Support for the Baldrige Award Framework in U.S. Hospitals." Healthcare Management Review 27(1): 62-75. Ham, C. 2005. "Lost in Translation? Health Systems in the US and the UK." Social Policy & Administration 39(2): 192-209. Institute of Medicine. 2001. Crossing the Quality Chasm. Washington, DC: National Academy of Sciences. Leape, L.L. 1994. "Error in Medicine." Journal of the American Medical Association 272(23): 1851-1857. Lewis, S. 2007. "Can a Learning-Disabled Nation Learn Healthcare Lessons from Abroad?" Healthcare Policy 3(2): 19-28. Lucas, J.A., T. Avi-Itzhak, J.P. Robinson, C.G. Morris, M.J. Koren and S.C. Reinhard. 2005. "Continuous Quality Improvement as an Innovation: Which Nursing Facilities Adopt It?" The Gerontologist 45(1): 68-77. MacIntosh-Murray, A., C. Porcellato and K. Born. 2006. Quality by Design Literature Review (v. 1.2). Unpublished. McCarthy, D. and D. Blumenthal. 2006. "Stories from the Sharp End: Case Studies in Safety Improvement." The Milbank Quarterly 84(1): 165-200. McLaughlin, C.P. and A.D. Kaluzny. 1994. 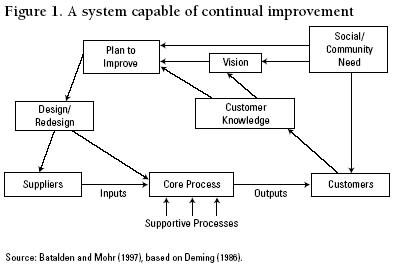 Continuous Quality Improvement in Health Care: Theory, Implementation, and Applications. Gaithersburg, MD: Aspen. Mohr, J.J. and P.B. Batalden. 2002. "Improving Safety at the Front Lines: The Role of Clinical Microsystems." Quality and Safety in Health Care 11(1): 45-50. Nabitz, U., N. Klazinga and J. Walburg. 2000. "The EFQM Excellence Model: European and Dutch Experiences with the EFQM Approach in Health Care." International Journal for Quality in Health Care 12(3): 191-204. Nelson, E.C., P.B. Batalden and M. Godfrey. 2007. Quality by Design. San Francisco: Jossey- Bass. O'Brien, J.L., S.M. Shortell, E.F.X. Hughes, R.W. Foster, J.M. Carman, H. Boerstler and E.J. O'Connor. 1995. "An Integrative Model for Organization-Wide Quality Improvement: Lessons from the Field." Quality Management in Health Care 3(4): 19-30. Øvretveit, J. and D. Gustafson. 2002. "Evaluation of Quality Improvement Programmes." Quality and Safety in Health Care 11(3): 270-275. Reason, J. 1995. "Understanding Adverse Events: Human Factors." Quality in Health Care 4: 80-89. Ryan, M.J. 2007. On Becoming Exceptional: SSM Health Care's Journey to Baldrige and Beyond. Milwaukee, WI: American Society for Quality Control. Saltman, R.B. and J. Figueras (Eds.). 1998. Critical Challenges for Health Reform in Europe. Buckingham, UK: Open University Press. Stubblefield, A. 2005. The Baptist Health Care Journey to Excellence: Creating a Culture that WOWs! Hoboken, NJ: John Wiley & Sons. Walshe, K. and T. Freeman. 2002. "Effectiveness of Quality Improvement: Learning from Evaluations." Quality and Safety in Health Care 11(1): 85-87. Womack, J.P., D.T. Jones and D. Roos. 1990. The Machine That Changed the World. New York: Rawson Associates. 1 The Commonwealth Fund surveys began with comparisons of the US, Canada, the United Kingdom, Australia and New Zealand. Results from Germany and the Netherlands have been added more recently.